Art Everywhere, the latest and most ambitious of these campaigns, bills itself as a “celebration of great American art. The monthlong effort scheduled for August and featuring famous artworks on some 50,000 billboards through the country, is being mounted by the Outdoor Advertising Association of America, a fact that might cast doubt on the notion that its fundamental purpose is, indeed, to celebrate American art. Particularly when the industry is feeling itself under attack almost everywhere by public opposition to the aggressive effort by big billboard companies like Clear Channel, CBS Outdoor and Lamar Advertising to replace conventional billboards with brighter, flashier, higher-revenue producing digital versions. The pitch goes like this: Billboards are important because they support economic activity, particularly small businesses that can’t afford to advertise on TV or other venues, but they are also valuable purveyors of public service messages. Billboards help in the search for lost children and dangerous criminals. They provide warnings of severe weather and up-to-the minute information about everything from natural disasters to election results and football scores. And they give non-profit organizations a voice to spread the word of good deeds amidst the clamor of commercial sales pitches. And finally, digital billboards, with their capacity for instant change and the display of multiple messages, make these benefits all that more important. In Los Angeles, where a debate over digital billboards has raged with varying degrees of heat for most of the past decade, billboard companies have enlisted several local non-profit arts organizations in this campaign to sell the idea of billboards as more than just platforms for commercial advertising. But the Art Everywhere campaign has taken a big step beyond, by recruiting the Los Angeles County Museum of Art among other heavyweight institutions like the Whitney Museum in New York and the National Gallery of Art in Washington, D. C.
It’s obvious that these partnerships are intended, at least from a museum director’s standpoint, to draw more visitors to the galleries where the original artworks are on display. In that sense, they’re no different than a billboard ad that says, “Visit The County Museum” or “Drop by the Whitney.” In another sense, though, it appears that they’re intended to legitimize the very existence of billboards as part of the cultural landscape, and not just a delivery system for public service messages. An artwork on a pole beside a highway as the functional equivalent of a statue on a pedestal in a park, weighty and immutable. Who knows if these museum officials gave thought to Art Everywhere as anything more than a way to ramp up attendance? For instance, the idea that displaying a work of art on a billboard that most recently displayed an ad for a McDonald’s hamburger doesn’t elevate the art, but helps reduce it to the status of a commodity. The cynic might say that art is indeed a commodity that is bought and sold like hamburgers and other consumer products, but the very fact of artworks on display in public institutions argues that art does indeed serve a purpose beyond commerce and consumption. And that purpose is arguably degraded by the conflation of art and billboards, which strikes at the heart of the fact that the act of appreciating an artwork should not be accompanied by the sense of being sold something. There are other reasons why this alliance of art museums and the billboard industry looks a lot like “sleeping with the enemy.” One is a purely a matter of aesthetics. Billboards frequently impose themselves on scenic views, obscure architecture, and generally create visual clutter. As aforementioned, billboards effectively commercialize and privatize public space, with sales pitches that not only turn those spaces into celebrations of consumption, but create a mono-culture where every face is bright and happy, where women are glamorous objects of desire, where the possession of things is the guaranteed path to happiness. And unlike ads on TV or in magazines or website pages, there’s no fast forwarding, there’s no turning the page, there’s no averting the eyes. Digital billboards, essentially large LED screens with ads that typically change every 6-8 seconds, amplify all these effects. In Los Angeles, all but a handful have been turned off by court order in a lawsuit over their permitting process, but Clear Channel and other companies are working mightily to convince the public that they should be turned back on. Some other cities have banned them, others have allowed a certain number in exchange for revenue and other benefits, but nowhere have they been without controversy, for all the reasons above, as well as concerns about traffic safety, energy consumption, and a negative effect on property values. 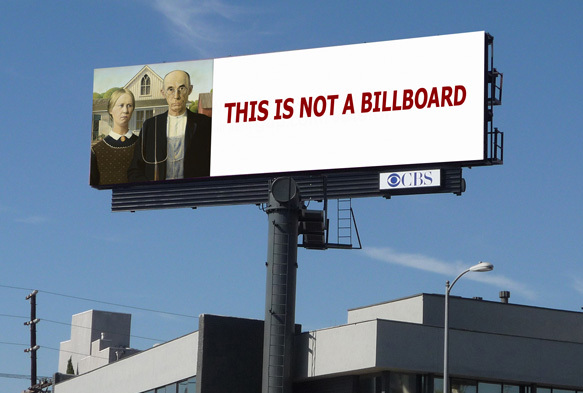 By joining the billboard industry in the Art Everywhere campaign, museums are saying that none of this matters. That getting a few more people into the galleries, that getting a few more people to become members, is what really counts, and that having unclean hands is a small price to pay.